STONE SOUR's next covers EP, "Straight Outta Burbank", has been completed for a tentative October or November release. The effort will include cover versions of songs by BAD BRAINS, THE ROLLING STONES, SLAYER, MÖTLEY CRÜE and IRON MAIDEN. Making a guest appearance on STONE SOUR's rendition of THE ROLLING STONES classic "Gimme Shelter" will be HALESTORM singer Lzzy Hale. During a September 15 appearance on the Des Moines, Iowa radio station Lazer 103.3, STONE SOUR singer Corey Taylor stated about "Straight Outta Burbank": "It's done, it's mixed. We've got the album artwork all together. [It's] looking to come out either October [or] November. So that's where that's at. And it's awesome. It's really, really, really good." He continued: "We're actually more into this one than we are [STONE SOUR's first covers EP, 'Meanwhile In Burbank…']. And that's nothing against the first one; the first one's super solid. This one, man, is so diverse, but it all feels really, really good. We're really stoked about it. We're doing everything from THE STONES to SLAYER. Like, it is on. It is so on, it's not even funny." In a recent interview, Taylor said that the band's third covers EP — titled "No Sleep 'Till Burbank" — will also feature five songs, and will include new versions of tracks from the following artists: VAN HALEN, VIOLENT FEMMES, BUZZCOCKS, RAGE AGAINST THE MACHINE and AC/DC. Released this past April as a Record Store Day exclusive , "Meanwhile In Burbank…" contained songs originally done by BLACK SABBATH, JUDAS PRIEST, METALLICA, KISS and ALICE IN CHAINS. Asked why STONE SOUR decided to release three separate EPs of covers, Taylor said: "This is something we've been talking about for years. And we decided, instead of putting it all on one, and trying to make that work, we were, like, 'Let's have fun with it.' It was kind of the same spirit of why we wanted to do 'em in the first place — is 'cause we wanted to have fun, just to kind of take the edge off, take the pressure off and just go in and have fun and kind of show the world what got us into making music in the first place. So we broke it up into three. That way, we could kind of play with the artwork, make it fun for the fans, and just have a good time with it. 'Cause we're making our nut on covers. But at the same time, when you do something like that, you wanna represent to the best of your ability. And by spacing it out and letting the fans get into five at a time, nothing gets lost in the shuffle. It just felt like by doing it that way, people would have time to digest each five before the next one comes on." Regarding the "Burbank" tie-in in the titles of the three EPs, Taylor explained: "[Burbank, California is] where [STONE SOUR drummer] Roy [Mayorga] lives, and we did all the music in his home studio. So I was just, like, 'Dude, the title's gotta be, 'Meanwhile In Burbank…' And then it just became, like, 'How can we play on that?' 'No Sleep 'Till Burbank'… 'Straight Outta Burbank'… It was just hilarious. At one point, I wanted us to dress like a black metal band in his front yard and play volleyball. Because there's this giant palm tree in the front, and there's always sun and people walking their kids, or whatever, and we're dressed like MAYHEM. And we didn't have time, 'cause [STONE SOUR bassist Johny] Chow is out with CAVALERA [CONSPIRACY], and Roy's been doing some stuff. So we just didn't have that time where we were all in the same state. But I was, like, 'We've gotta remember that one, 'cause that could be rad.'" 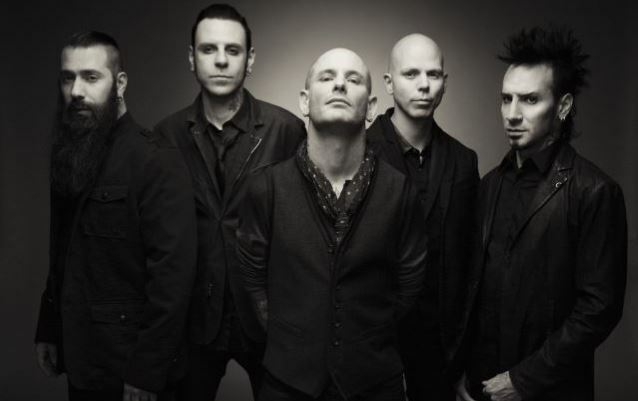 On its last North American tour, STONE SOUR played a different cover every night, including songs that made the EP such as METALLICA's "Creeping Death", KISS's "Love Gun" and JUDAS PRIEST's "Heading Out To The Highway". Taylor is currently on tour with his other band, SLIPKNOT. Guitarist Christian Martucci joined STONE SOUR in late 2013 as the replacement for Jim Root, who was fired from the group after deciding he wanted to sit out the band's last tour in order to start work on the next album from SLIPKNOT, of which he is also a member.